As part of Orientation Week, the Campus Life and Engagement Office is organizing a street fest type of party on the lower campus Tuesday afternoon, immediately following the big tomato harvest celebration. 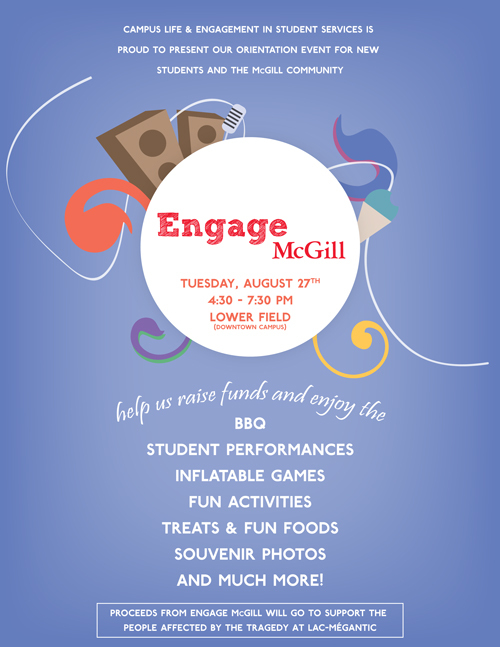 With performances from students and groups, games, inflatables, a BBQ, fun treats and much more, the Engage McGill event aims to bring together new students, University staff and other members of the McGill community. At the same time, said McGill’s Student Life Co-ordinator Mitch Miller, the event will raise funds to support the town of Lac-Mégantic, which was devastated when a runaway train of tanker cars careened into the town, setting off a massive explosion and numerous fires that killed 47 people on July 6. “We’re holding an event to celebrate our community and we want to be thinking about the larger community that needs our help,” Miller said. While new students will get a free ticket to the BBQ, others will be asked to make a donation for food and treats and roving volunteers will pass the hat to collect money for the victims of the Lac-Mégantic disaster. The Engage McGill event takes place Tuesday, Aug. 27, from 4:30 p.m. to 7:30 p.m. on the Lower Field. All members of the McGill community are welcome to join the fun.